"My name is Marsha. 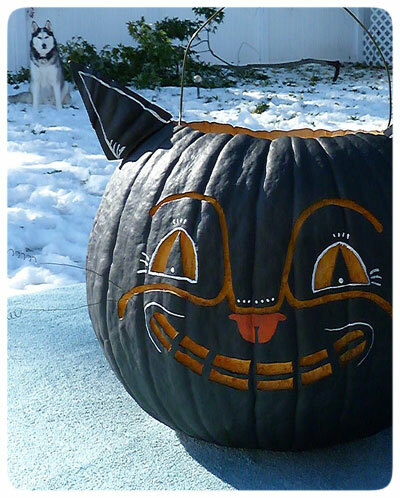 I've admired your beautiful Halloween folk art figurines, and they inspired me to carve a cat pumpkin this year. I wanted to share some of my photos of it - I hope you like it. You're work is absolutely beautiful!" Well, thank you for sharing Marsha! 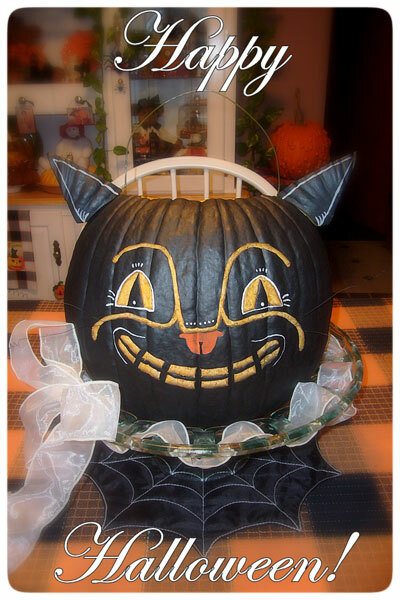 Your cat pumpkin is adorable, and by the way, YOU are too! Notice Marsha's faux fur ears, cuffs, trims and her Johanna Parker Design Black Cat Tee! Marsha explains that she had an unexpected ice & snow storm during that week in October when she was carving her annual pumpkin. "I did it with no power in the house and photographed it outside where snow lay on the ground with my Siberian Husky looking on in the background! LOL. I have had a passion for drawing, painting and photography for many years - so with each Fall I look forward to decorating my home for Halloween, and I try to make a unique jack-o-lantern. 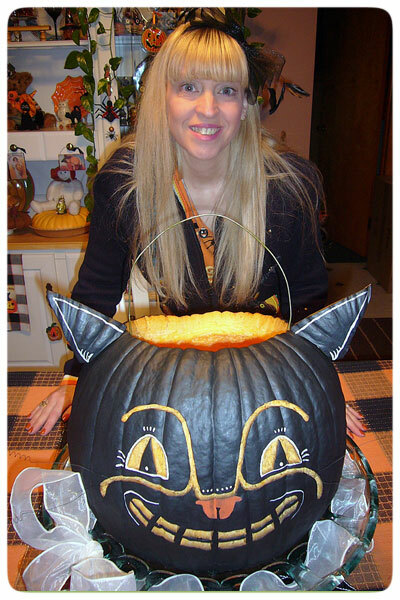 Last year (2011) your beautiful art work inspired me to do the cat pumpkin!" Well Marsha, you did an amazing job carving this fun character by candlelight! What a fun story! If you have a project that you would like me to consider for an upcoming Art Affect feature, please EMAIL ME with your photos. I am looking for clever ways that my work has inspired others. Copycat work is not acceptable, but those of you that have added your own unique twist to a personal project, inspired from my designs, are welcome to submit.